Diwali is done and dusted and all the industrious food bloggers have progressed to preparing Christmas goodies, but I can’t seem to relocate my food focus without apposite valediction to one unassuming, unsung hero. There may be scores of stars like laadus, burfi, gulab jamun, karanjis or gujiyas, shankarpale and anarase that emblazon Diwali. Crisp and savoury snacks like shev, chakali, kadboli add sizzle to balance the taste buds. But there is only one dependable knight “in a rather drab” armour among the Diwali dramatis personae – the gallant chivda! It doesn't take much effort or cost to make a big bin full of chivda. Not much can go wrong with the chivda, unless you are determined to ruin it by charring the peanuts, starving the chivda of essential emollients by scrounging on the oil, or leaving the poha limp and listless and not being vigilant in ensuring the copra isn’t rancid. It’s got staying power; in that the chivda can be used to bolster the plates or packets that you send to neighbours. When you receive plated bits and bobs in reciprocation, you can in turn pick out eminent stuff and chuck the uninspiring neighbourhood chivdas all together. The versatile and democratic constitution of the chivda allows a seamless amalgamation that comes in handy when all your homemade goodies are on the brink of exhaustion and you need to entertain unannounced guests. 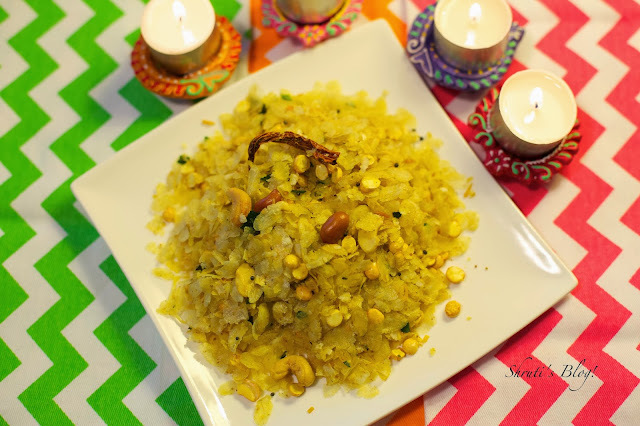 Though it is not something your guests reach out for at the first go during a Diwali party, the gallant chivda rushes to your rescue when some holier-than-thou guest spurns your rich offerings and heads for some low calorie stuff. And don’t forget, as a gifted taste-bud whisperer, the chivda joins forces with chaha or chai to soothe high-strung, cloyed and feast-worn palates. While the stars take centre stage during the four-day long festivities, the self-effacing, courteous chivda stays in the wings, stepping in with unswerving loyalty when the festivities finish and all else is spent. Quite like the amigo who brings you a cup of tea when you capsize into a chair after the “barat” has left the mandap. The true vindication of the chivda comes only in the end, when as a true benefactor it braves decimation each passing day getting shorn of cashewnuts, peanuts and copra slices by inconsiderate, fussy pickers. The chivda is a self-sacrificing, yet happy donor that will put any knacker to shame. It is willing to repose its remains in a missal with hot and spicy sprout usal, chopped tomatoes and onions. Even the sweet and salty spluttered mustard seed dregs find their way into a dal, chutney or subji in my kitchen, while the fried red chillies come in handy as garnish. All that remains is the comforting memory, till the next time I make another bin-full of the chivalrous chivda. Heat oil in a large kadai. Add mustard seeds to splutter and then the peanuts. Lightly roast the peanuts and then add green chillies, curry leaves. Let the chillies and curry leaves start to get crisp, and then add red chillies, cashew nuts, roasted chana dal, grated coconut, sesame seeds, poppy seeds. Make sure not to burn any of these nuts and seeds. Then add the cumin and coriander powders, hing and turmeric. Remove from heat. 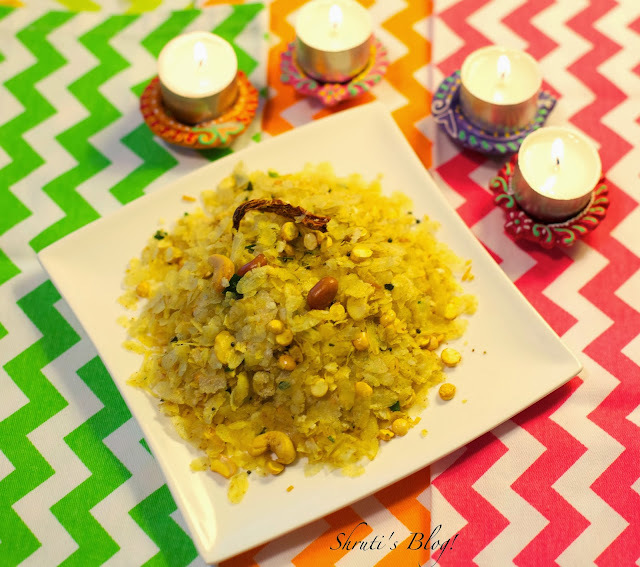 Quickly introduce the poha, add salt to taste and the sugar and mix well. Put the kadhai back on very low heat, stirring the chivda continuously until the entire lot suddenly starts to become lighter. Immediately remove from heat. Allow the chivda to cool down and get crisp. Store in an airtight container so the chivda stays crisp for a long time. I have the perfect accompaniment with the chivda. Amazon shipped off my copy of 'A Ragdoll after my Heart.' I shall celebrate Diwali reading it while munching on the chivda. Wish you and the family a glorious festival of lights. So nice ! I am remembering one Diwali when I had got some jalebis for you and your dad! Miss those days... Hope you and Bob have a great Diwali too! The time has come to take the plunge. into a public Chivda life.